Readers may recall The Copenhagen Diagnosis, a (so-to-speak) non-governmental international climate assessment published in November 2009 and targeted by activists at influencing deliberations at the Copenhagen conference. Because it coincided with Climategate, it received little-to-no critical attention at climate blogs. Thus, I suspect that few, if any readers, will (without peeking) be able to guess the answer to today’s trivia question about The Copenhagen Diagnosis: who holds the copyright to The Copenhagen Diagnosis itself? The surprising answer is that the copyright to The Copenhagen Diagnosis is the sub-charterer of the Ship of Fools: the University of New South Wales (click on image at left for enlargement of the frontispiece). Out of all the universities and institutions in the world, why the University of New South Wales? Dunno. Its co-authors included both Real Climate bloggers (Michael Mann, Stefan Rahmstorf, Eric Steig) as well as University of New South Wales academics (Matthew England, Steven Sherwood, Ben McNeill, Andrew Pitman), Turney’s University of Exeter associate Peter Cox and longtime activists such as Stephen Schneider, Hans Joachim Schellnhuber, Andrew Weaver and Richard Somerville). The document itself contained no information on sources of funding. 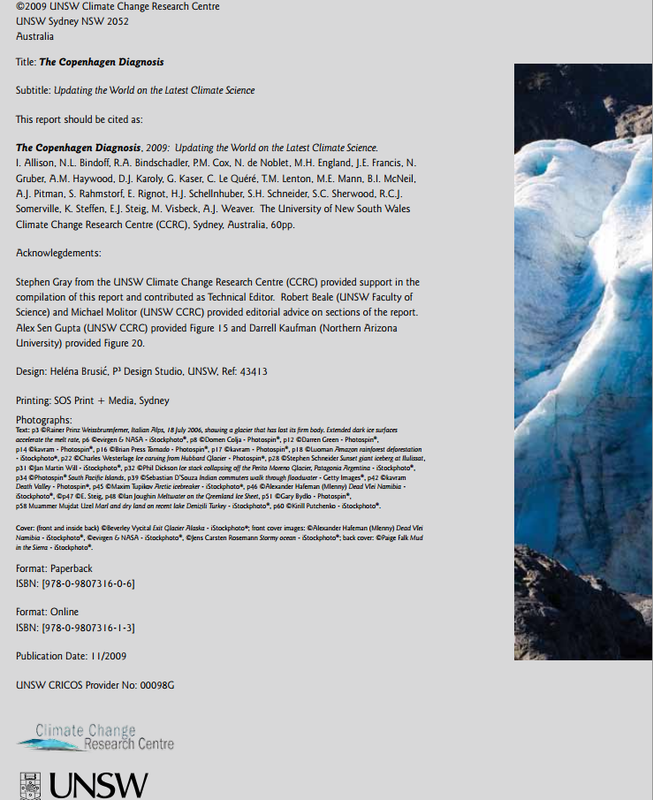 Some of the authors appear to have also been involved with the large consciousness-raising conference of climate scientists in Copenhagen in March 2009 – see its Synthesis Report also bearing Copenhagen in its title (Richardson, K. et al., (2009) Climate Change: Global Risks, Challenges & Decisions. Synthesis Report of the Copenhagen Climate Congress. (University of Copenhagen), a report that was cited by The Copenhagen Diagnosis. Turney, then still at the University of Exeter, was a session chair at the March 2009 conference, as was Matthew England of the University of New South Wales, both subsequently (July 2010) recipients of lucrative ($3 million) Australian Research Council Laureate Fellowships. Curiously, Turney made an initial appearance in Climategate documents in March 2009, writing to Jones and Briffa about a scheme to get UKP 3 million in NERC funding, a topic that I’ll return to in a later post. This entry was written by Stephen McIntyre, posted on Jan 22, 2014 at 12:48 PM, filed under Uncategorized. Bookmark the permalink. Follow any comments here with the RSS feed for this post. Both comments and trackbacks are currently closed. I haven’t been blogging lately but I did write a post about that document at the time. I didn’t find it a useful addition to what had already been published on the various topics. I wonder if any recent evidence as caused a rethink. Could you offer some real credible evidence for this – given the fact that the fiasco last month with several ice breakers becoming stuck in abnormally thick ice. Antarctica losing ice mass? Are you paid to spread this rubbish or are you a willfully deceived. There’s a need to differentiate between the ice from glaciers & sea ice. The Antarctic ice-loss as reported, is from the icecap, ie glacial. We’re supposed to believe that this melt, is cooling the seas around Antactica, thus causing more sea ice to form. Note that “Global sea ice area was at a record January high on Jan 1, and has been averaging 3,000 Manhattans above normal over the last 11 months.” Similarly, while models “robustly” predict declining Antarctic sea ice, the actual Antarctic sea ice is at near record high levels. As Richard Feynman politely described the scientific method: if the models do not fit the data, they are wrong! Was it all done on a voluntary basis ? Who mentioned it and when? shown (from Mann et al. 2008).” Some things (fine wines, CPS & EIV paleo reconstructions) only improve with the passage of time. Post-scientific climate theories use 95% coincidence intervals now. This helps them to explain everything, even cold caused by warming. So the Theory of Everyting may arrive anytime soon. Finally! Newton’s 3rd Law of Models states: For every model action, a tweak exists for an equal and opposite reaction if needed to explain something away. amac78: agree, non-overlapping 95s and Mannian smoothing and all. Work of art. My first thought was that the copyright would be held by some alarmist university or other. So I plumped for the usual suspects, UEA. Oh well, it was a decent try… If only Turney had been affiliated with UEA rather than University of Exeter (which just happens to be where my Ph.D. is from). So many people working so hard in the run-up to Copenhagen … and little FOIA. Thank you for this fascinating series of posts, Steve. Turney as hustler in the Climategate emails sounds like a treat. As they say sunlight is the best disinfectant. It’s clear that UNSW has been a hotspot for “alarmists” for some time and the more sunlight that can be brought to bear on this group and their questionable scientific persuasion the better. You should also not forget their convenient little propaganda arm Deltoid, run by a colleague down the corridor. Tim Lambert works there too (teaching Computer Science). *Timmy and Turney, now there’s a fair pair ….. I believe Mr. Lambert has found gainful employment with Google. We should salute them for removing one of the more tedious alarmist voices from the daily disputes. or better still let them make fools of themselves. Nothing like simply slapping (in the case of Fig 19+20) or grafting (in the case of Fig 21)real observations onto proxy reconstructions. I always knew proxies were just thermometers in disguise! Also, very nice to see that global temps haven’t varied by more than 0.5C over the course of 2000 years (until man got his dirty hands on things in the 20th century). Apparently not something a “real scientist” would do. I’ve been following you, on and off, for about 5 years, so I know that you’ve been dealing with the “Hockey Stick” graph. have you seen the new batch of hockeysticks in the AR5. The pdf file is “WG1AR5_FinalDraft_All.pdf. It’s 2216 pages long. look for pages5-117,118 and 125. If you have not yet acquired a copy would you like me to up-load it to you? It’s 165.9Mb, if your email system can accept that size of file. I haven’t run stats on this but looks like a very strong inverse correlation. Don’t know what happened to the raw data. Older data and newer data may have been gathered by different means and spliced together. But looks as good as any info. That sounds like a wonderful topic. I’m wondering, Steve, if you’ll post on that. I well remember the pre-Copenhagen foreplay conducted by the “large consciousness-raising conference of climate scientists” in March 2009. George Monbiot went there and reported on it in the Guardian. And bullsh*tted myself, into the bargain”. The Hockey Team, tired of all the ice, has changed its name to the Chicken Little Brigadiers.